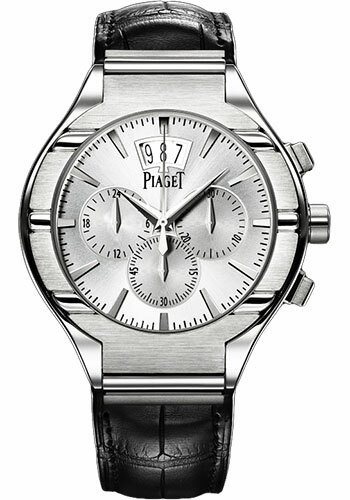 43 mm 18K white gold case, 11 mm thick, sapphire back, silvered dial with 18K white gold hour markers, 880P automatic movement with flyback chronograph, second time zone at 9 o'clock (24 hours), date at 12 o'clock, hours, minutes, minutes counter at 3 o'clock (30 minutes) and small seconds at 6 o'clock, approximately 50 hours of power reserve, black alligator strap, folding buckle. Water resistant to 05 ATM. 43 mm 18K white gold case set with 34 diamonds (1.5 ct), 11 mm thick, sapphire back, diamond bezel, silvered dial with 18K white gold hour markers, 880P automatic movement with flyback chronograph, second time zone at 9 o'clock (24 hours), date at 12 o'clock, hours, minutes, minutes counter at 3 o'clock (30 minutes) and small seconds at 6 o'clock, approximately 50 hours of power reserve, black alligator strap, folding buckle. Water resistant to 05 ATM. 43 mm 18K rose gold case set with 622 diamonds (approx. 4.6 ct), 11 mm thick, sapphire back, diamond bezel, gem set dial with 18K rose gold dial set with 262 diamonds (approx. 0.8 ct), 880P automatic movement with flyback chronograph, second time zone at 9 o'clock (24 hours), date at 12 o'clock, hours, minutes, minutes counter at 3 o'clock (30 minutes) and small seconds at 6 o'clock, approximately 50 hours of power reserve, brown alligator strap, folding buckle. Water resistant to 05 ATM. 43 mm 18K rose gold case set with 40 diamonds (approx. 1 ct), 11 mm thick, sapphire back, diamond bezel, silvered dial with 18K rose gold hour markers, 880P automatic movement with flyback chronograph, second time zone at 9 o'clock (24 hours), date at 12 o'clock, hours, minutes, minutes counter at 3 o'clock (30 minutes) and small seconds at 6 o'clock, approximately 50 hours of power reserve, brown alligator strap, ardillon buckle. Water resistant to 05 ATM. 43 mm 18K rose gold case, 11 mm thick, sapphire back, silvered dial with 18K rose gold hour markers, 880P automatic movement with flyback chronograph, second time zone at 9 o'clock (24 hours), date at 12 o'clock, hours, minutes, minutes counter at 3 o'clock (30 minutes) and small seconds at 6 o'clock, approximately 50 hours of power reserve, brown alligator strap, ardillon buckle. Water resistant to 05 ATM.